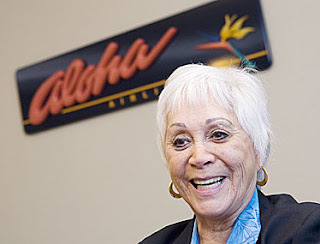 Patti Smart, the Number One flight attendant at Aloha Airlines, is retiring -- reluctantly -- after more than 50 years of service. The woman nicknamed the 'Queen of Aloha' will retire this coming Friday, but she says, "There will be sparks flying from my feet as they drag me down the runway." A lot has changed since the old days, when people dressed up in hats and bow ties to fly on propeller-powered planes across the Pacific. "You're supposed to have the same niceness, the same warmth, the same caring. But it's faster now," Smart said. "In the older days, the flights were longer so you had more time to be intimate with passengers and you got to be very good friends with them." While she must have a million good stories to tell from those 50-plus years of flying, she did share this funny one with the newspaper reporter. As she was serving pineapple juice to passengers, she spilled it all over her uniform. She changed into a pair of pants and washed out her skirt in the lavatory. When she tried to air-dry the skirt by letting it flap out the window in the cockpit, one of the two pilots snatched it and let it fly out the window. "I wanted to kill those two. I wanted to get their two heads together and whack them. They were laughing and laughing," she said. The joke didn't stop there. Another pilot on the next flight out radioed her plane and said he had caught the skirt as it went flying by. Perhaps that incident happened while she was working on a DC-3 early in her career. She certainly has seen a lot of changes to the airline industry since then -- including the introduction of jet aircraft. 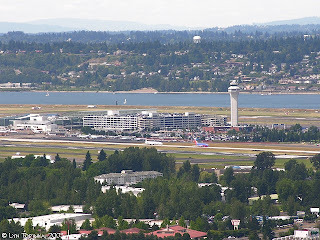 Congratulations and aloha to Patti Smart as her long career in the air comes to a close. Click here to watch a KITV News Video about Patti Smart's final flight on Aloha Airlines. Click here for many more photos of Patti Smart, the Queen of Aloha.